08 Tire Gardens -- Potatoes, Strawberries, Etc. Tire Gardens: Potatoes, Strawberries, Etc. and be sure to thank them publicly! Seed potato sections, alpine strawberry starts, tomatoes, eggplants, peppers, etc. The hard thing about school gardens, or starting a garden in a place where there has never been a garden before, is that the soil is often of very poor quality. Kids have been running on it and packing it down for years. It often has poor soil with lots of clay that makes it very hard to dig. Or there is sand, gravel, rocks and shards of glass that just make the whole prospect of garden bed preparation sound like too much work. The richer and looser the soil, the better your gardening success is likely to be. The best way to get that kind of soil is to prepare a new, raised bed, that lifts the planting surface several inches above the rest of the ground, and either walls it in, or piles it up. A raised bed is especially useful for a root crop like potatoes, which need to be at least 12 inches below ground level. It's also great for plants that spread by shooting out "runners" that are much more likely to root in rich, crumbly soil, like strawberries. There's a fast, easy way to get rich, loose garden soil for all kinds of plants . . . and this way is exciting for today's kids because it involves recyclables! You simply place an old tire on a spot with full sun all day, and on level ground, to create a mini raised bed. 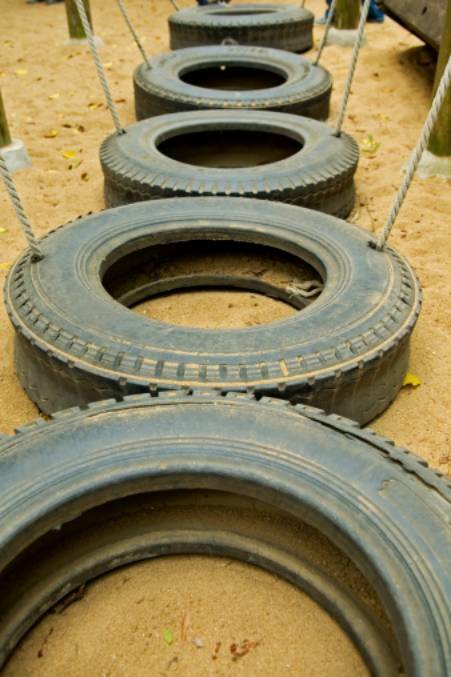 You can put several tires together in a row, designate one tire for each child in your group and let them make labels or painted stakes with their names and the name of the plants they're growing, or just make one tire garden. Ask at local garden stores when is the best time to plant; some plants can be started in March, but in colder climates, you might want to wait 'til around Mother's Day. First, put newspaper down on the places where tires will go. Either trim it so that it fits under the tire, or place mulch on top of it where it sticks out around the outside of the tire. The mulch is to keep weeds down. Be sure to pour water on the newspaper with a hose or watering can to make sure it's drenched. Then place the tire, or stack of tires, on top of it. Fill the inside with black, rich compost, and you're set for strawberries, annual flowers, or other plants with fairly shallow root systems. § For a four-pack of alpine strawberries or annual flowers such as marigolds and petunias, one tire should do. Plant, keep watered daily, and add liquid fertilizer, such as Miracle Gro, every two weeks or so. Alpine strawberries are a good choice for a tire garden because they don't spread by "runners," so they will be happy inside a tire, and they bear small strawberries all summer, not just a few large ones in June. § Two car tires, stacked on top of each other, make a nice "bed" deep enough for roots for a tomato plant, eggplant or pepper plant, when the two tires stacked on top of each other are filled with compost. You might need 3-4 bags or more. As a bonus, these three plants love a warm or even hot environment, and the black rubber of the tire will retain heat and radiate it into the soil. That's great, but just be sure to water this tire garden every day, if it doesn't rain, so that it doesn't overheat. Be sure to fertilize every two weeks. § Three wider truck or tractor tires make a great home for three potato plants - red, gold, white, blue potatoes, whatever you'd like to try. But there's a trick with a potato tire garden. You set aside two of the three wider tires with this project, until later. You'll have to have extra compost set aside as well. First, set up the bottom tire, fill partially with compost, about 2/3 full, and place cut-up seed potatoes - probably no more than three per wider tire. To prepare a seed potato for planting, cut it in half or smaller chunks so that there is a nice "eye" in the chunk. That's where the roots and leaves will spring from. You can't just use grocery-store potatoes - you have to go to the garden store and buy seed potatoes specifically for this purpose. Cover the chunks with an inch or two more of compost, and water in. Keep watering daily. The green plants should start growing soon. Add liquid fertilizer, such as Miracle Gro, according to package directions, every two weeks when you water. Wait for a few weeks, until the green plants are pretty tall. Then place a second tire on top of the first one. Don't be shy about putting more compost all around the green plants. Don't worry; you won't suffocate the potato plant. You need to keep the sun away from the potatoes, which are developing 'way down at the bottom. After another few weeks, if the green potato plant is again sticking 'way up above the tire, add the third tire to the stack, and add more compost around the leaves, just as long as at least 8" or more of the potato plant is still visible. Keep watering daily, and apply liquid fertilizer every two weeks. Potatoes are mostly water, so they need a lot of it to form. At summer's end, before frost, it is really fun for kids when they get to lift the two top tires off, and gently pull up the potato plants, revealing the big, round potatoes that were growing inside all along - sight unseen! You need to let potatoes "cure" in light shade, protected from rain, for a week, before you store them . . .that is, if you don't plan to wash, cook and eat them right away!